PC Settings in Windows 8 – Before we discuss about how to open the PC Settings in Windows 8, we must know the work of PC settings in Windows 8. 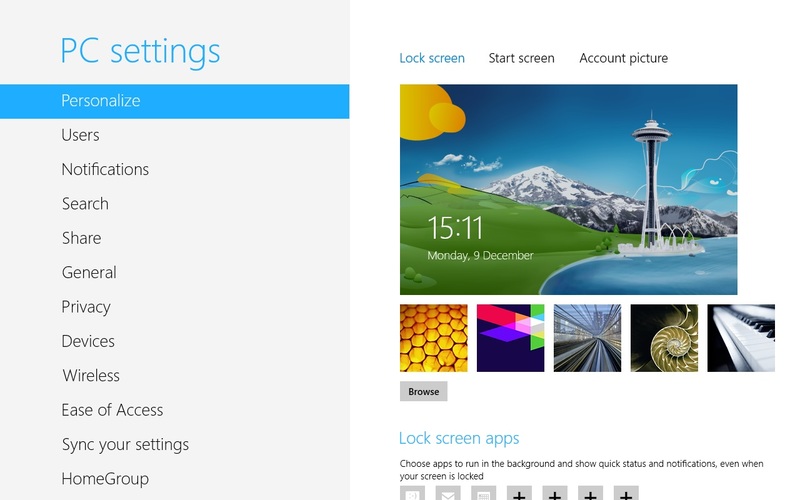 So that we can get a detail idea about the PC settings of Windows 8. Open Charms Bar of Windows 8. Now click on “Open PC Settings” on the Setting Charm. That is it. Now your PC Settings for Windows 8 is open. Personalize : Customize your Start Screen, lock screen, account picture etc from here. Users : Maintain the password and multiple user account. Notifications : Modify the windows notification setting. Search : Modify the search setting. Share: Modify the settings that how you want to use your PC on a shared network. General : It contains some of the general settings of Windows like time, day light saving, troubleshot tool etc. Privacy: It contains the privacy setting for the location, account picture, apps etc. Devices: It shows all the available devices for your Windows 8 PC and you can add or remove different devices from here. Wireless: Modify Wireless setting (Bluetooth and WiFi) of the PC. Ease Of Access: This includes settings to make Windows more navigable by people with challenges in vision and hearing. Sync Your Setting: It helps to synchronize all Windows setting with a Microsoft Account. HomeGroup: This lets you choose which libraries to share with other computer in the HomeGroup. Windows Update : Settings related to Windows update like turn on or off windows update or when to receive updates in Windows 8 etc.